We’d just gotten through an 8 course seafood dinner that included a whole chicken and whole crab when my friend Russel declared “I’m gonna take you to meet my Italian family man!” To understand the irony of this statement you should know that Russel, is literally a rockstar photographer who’s shot the likes of Michael Jackson, Naomi Campbell, and Jackie Chan; he’s also Singaporean. We pull up to Ristorante Da Valentino, an unassuming storefront in a quiet residential neighborhood. If it weren’t for the Maseratis, Benzs, and a Rolls Royce parked outside, you’d have no idea the place was even open. By the looks of it, they were having a busy night. With my gut painfully bulging over my snug seatbelt, a small part of me was hoping Russel would decide it was too crowded and leave. My hopes were dashed when he zoomed up the narrow cul de sac and parked in a spot that I could only assume was a parking ticket in the making. As we walked into the restaurant, Russel pointed out all the F1 photos on the wall he’d taken as well as one of F1 Supremo, Bernie Ecclestone dining in the restaurant. I was mulling over all the celebrities that had eaten there when Papa Gianni strode towards Russel as though he was welcoming home a long lost son. “I have a table for you” he said with a Singaporean tinged Italian accent. We were whisked over 2 doors, past sister Perla’s Pastry shop, and into the private dining room. 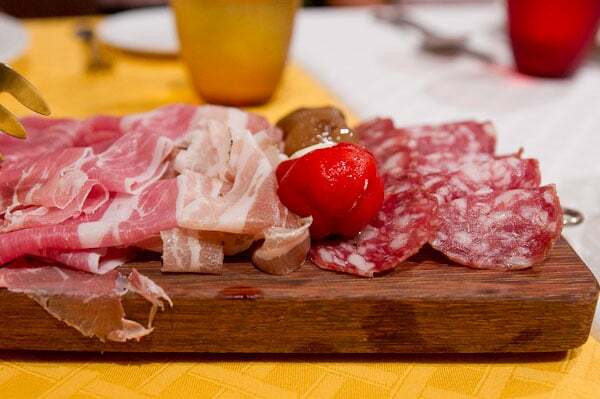 Once seated a platter of salumi materialized on the table. I was so full I couldn’t imagine cramming anything else into my stomach, and yet there in front of me was a gorgeous carving board covered in shiny, paper thin cuts of cured meat. How could I refuse?! The next thing I know chef Valentino is out asking us what kind of pizza we want. “è piccolo, it’s small!” he says, gesturing with his thumbs and forefingers. Unsurprisingly a full sized pizza emerged from the kitchen a few minutes later. Thin crust with delicate bubbles charred ever so slightly on top. 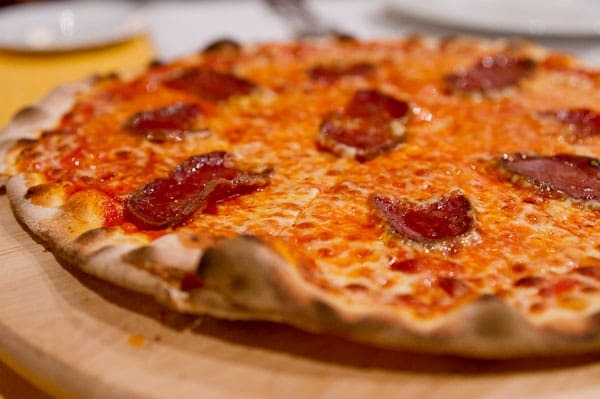 A smattering of fresh tomato sauce, a thin web of cheese and thick slices of salame piccante topped this pizza. The crust was crisp all the way to the center, and yet there was just enough dough above the crisp layer to remind you that this was a pizza and not a cracker. The tomato sauce was pleasantly sweet and tangy and tasted of fresh tomatoes. There was just enough cheese to bind the toppings to the dough, but not enough to be greasy or overwhelming. And the salame piccante was savory and spicy hitting all the right places in my mouth. I managed to cram down two slices, but had I been more hungry I could have easily finished the whole pie. Just as I was wondering if it would be possible to fit another slice of pizza in my stomach, a white plate with little cream colored cylinders about the size of macaroni covered in a creamy white sauce showed up. The waiter announced that it was gorgonzola gnocchi before bending over to set it down. Before the plate hit the table, Russel’s wife Judy jumped in, wondering if it was for another table. I breathed a shallow sigh of relief, but part of me wanted to have just one bite. At this point, I wasn’t too shocked when the waiter came back and casually placed the plate on the table, right in front of me. What did surprise me was how mild the aroma was as it wafted up to my nose. It was seductive. My hand instinctively reached for my fork and before I knew it there was a piece of gnocchi in my mouth. Each morsel was tender and yet they had just enough bite to remind you that they aren’t just mashed potatoes. The cheese was surprisingly mellow but had a deep nutty flavor that made it almost impossible to stop eating. It wasn’t long before the plate was cleaned. I later learned from the chef that he’d perfected a technique to include much less flour than most gnocchi recipes. This made the dough difficult to work with, but made for a pillowy soft gnocchi with a heavenly texture. Three desserts followed, a Panettone, a Tiramisu, and a mystery Panna Cotta. 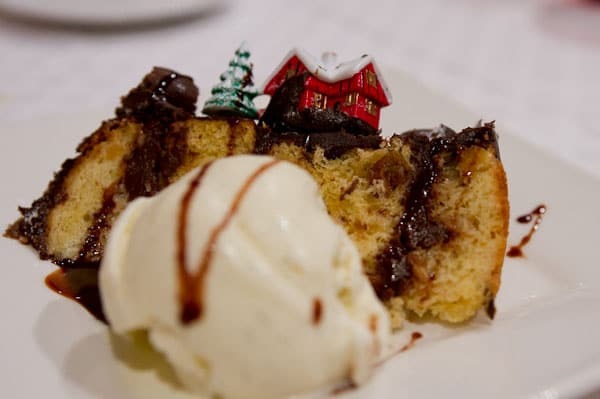 The Panettone, and Tiramisu were both delicious, each with a special twist that set them apart from the usual, but it was the Panna Cotta that really captivated me. 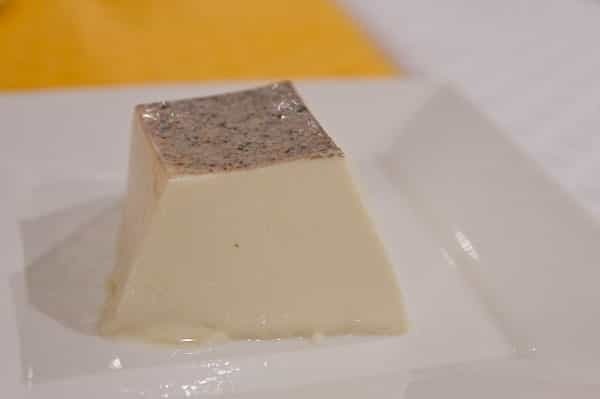 When the pastry chef, Valentino’s sister Perla, brought out the Panna Cotta, she had a coy smile on her face asking us if we could figure out what flavor it was. It looked like a jiggly pyramid with its top cut off and had a thin purplish grey layer on top. Curiosity piqued, I scraped the edge of my spoon along the top to remove just a bit of the grey gel. I didn’t get my spoon half way to my nose when the pungent aroma of white truffles smacked my olfactory senses. You see, Perla had just flown back from Alba that morning, with a fresh stash of gorgeous white truffles. Each about the size of of a large walnut with a crust of damp earth still clinging to each knobby tuber. The panna cotta was divine. Decadent and creamy, without being cloying or overwhelming. 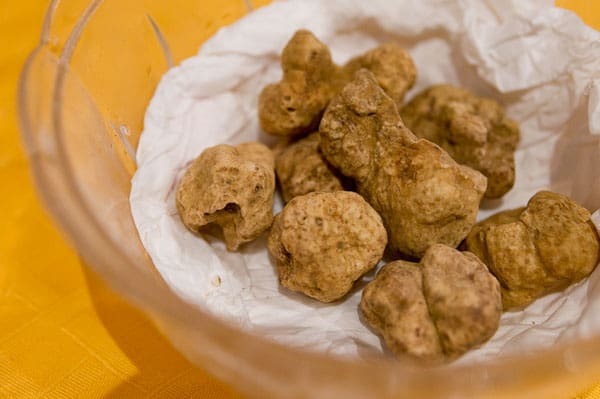 The white truffle was assertive without having the strong gasoline-like odor that fake truffle oils often have. It was the perfect dessert to finish off a perfect meal. Helped along by a glass of grappa I nearly forgot that this was my second meal of the evening. I have a rule about avoiding European restaurants in Asia. Most places aren’t good, and even in the rare instances when they are, I can’t help but question the logic of flying all the way to Asia to eat something that I can get at home. 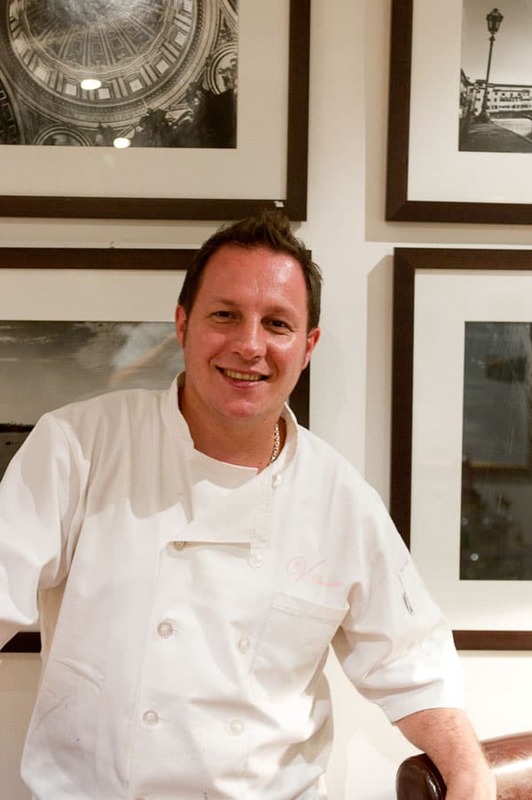 But for Ristorante Da Valentino’s I’ll make an exception to that rule. I only hope that I’m more hungry the next time that I go.